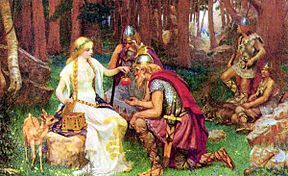 Norse mythology is a set of beliefs and stories shared by Northern Germanic tribes. It was not handed down from the gods to the mortal. It had no scripture. The mythology was passed on from one generation to the next in the form of poetry. It continued to be passed down this way through the time of the Vikings. The original beliefs were long lost. Our knowledge about it is mainly based on the Eddas and other medieval texts. These were written down during and after they turned to Christianity. In Norse mythology, the earth was thought to be a flat disc. This disk is in the branches of the world tree, or Yggdrasil. Asgard was located at the centre of the disc. Asgard is where the gods lived. Asgard could only be reached by walking across the rainbow (the Bifröst bridge). The Frost Giants lived in an place called Jötunheimr. Jötunheimr means giant realm. Jörmungandr the sea-serpent that is coiled around the world. 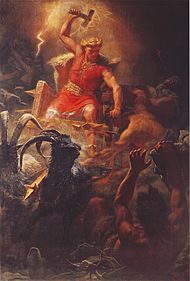 Norse mythology Facts for Kids. Kiddle Encyclopedia.